Western Canadians know the hassle of starting your vehicle in the cold and the sweet convenience of having luxuries like remote start or seat warmers. Our long winters are why we often forget the consequences at the other end of extreme temperature. Vehicles can become very warm when left out in the summer sun on the Prairies, even dangerously so! For tips on how to keep your vehicle cool this summer, keep reading for Park Muffler’s crash course on the subject. Park carefully. Location, location, location– sure that may be an old real estate saying, but you should always keep it in mind when parking on a hot day. Look for shady areas that will keep your vehicle cool naturally, but always consider how long you will be leaving it there. If it is long enough for the sun to move across the sky, your previously shady spot may turn out to be a scorcher! Cover-up. If shade is out of the question, you may need to resort to some creative tactics to keep your vehicle cool. You can create your own shade inside the vehicle by covering the seats and other exposed surfaces with common items like blankets or towels. When you return to your vehicle, move aside the fabric that has absorbed the heat and you will find a much cooler surface underneath. Open windows. One of the most common strategies for cooling off a warm interior is driving with the windows open. If you have to be away from your vehicle and it is in a safe area, consider leaving at least two windows cracked open to create an airflow. This may not be very effective on its own, but it can help avoid the worst consequences of extreme heat. Seat coolers. Whether installed at the factory, by your favourite garage or even do-it-yourself– there are a wide variety of seat-cooling options on the market. Different systems use different methods, but they all achieve the same result: cool and comfortable upholstery no matter how hot it is outside. Shades & tint. Try using a sunshade or dash cover that can be propped up in your windshield. 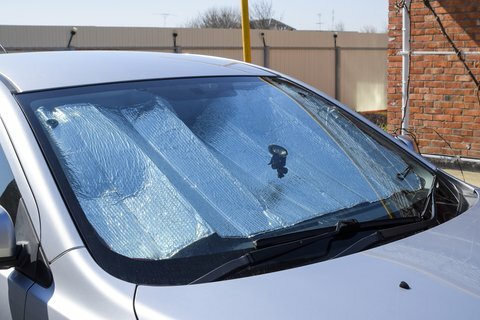 Remember, these will only reduce the heat coming in the front of the vehicle– so be sure to cover other windows. Alternatively, you could invest in professional tinting that can also keep things cool, even when driving. The above tips are only a short summary of the many ways you can keep your vehicle cool in the summer. If you have any questions or concerns, contact or visit Park Muffler today!